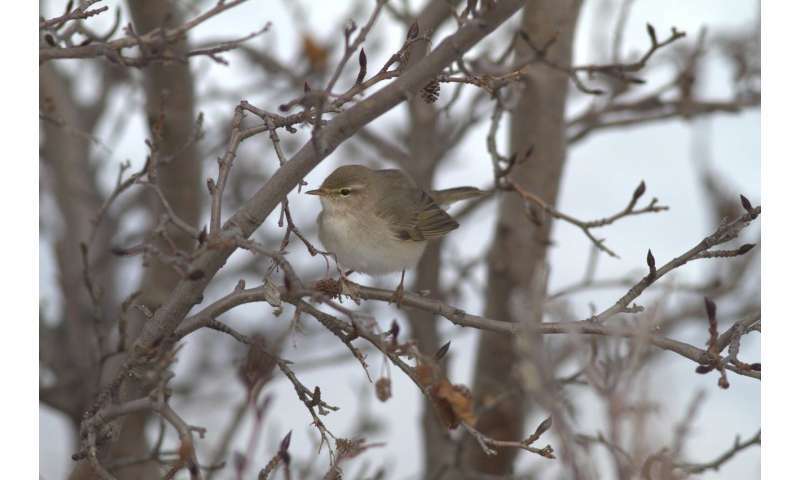 Researchers at Lund University in Sweden have studied flight routes to determine how far willow warblers migrate in the autumn. The results show that the willow warbler holds a long-distance migration record in the ten-gram weight category – with the small birds flying around 13,000 kilometres or longer to reach their destination. The recently completed study investigated willow warblers that breed during the summer in north-east Russia. Biologists at Lund University together with Russian researchers from Magadan, close to the Kamchatka Peninsula, managed to get a good overview of the route and distance travelled by the small birds during their autumn migration. The measurements were taken by small data loggers attached to the backs of the birds. The next year, the birds were recaptured and the researchers downloaded and processed the data. From their breeding habitats in eastern Siberia, the willow warblers fly to staging areas located in south-west Asia and the eastern Mediterranean. From there, they continue to their winter destinations, located in Kenya and Tanzania – a distance of around 13 000 kilometres. "Our measurements show that they migrate 13 000 kilometres, but we have not been able to measure the entire distance because the data logger batteries ran out. My guess is that they fly at least another 1 000 kilometres to south-east Africa," says Susanne Åkesson, professor at the Department of Biology at Lund University. Other studies have shown that there are birds that migrate farther, but they looked at larger birds that weigh more. Willow warblers weigh 8–9 grams during the breeding period and about 10 grams when they migrate. "I think it's fascinating – they are so small and migrate at least 13 000 kilometres one way. There are no other studies that show that birds of that size can migrate that far. Even more impressive perhaps is that they make the journey alone in their first year of life," says Susanne Åkesson. In addition to the record for long-haul migration, the study is also the first to show where the most easterly willow warblers spend the winter in east Africa. Moreover, the researchers compared alternative compass routes with the routes the birds actually take. Based on this, they identified two alternative mechanisms that the willow warblers can use during their long migration –a solar compass that compensates for time shifts during the migration, and a magnetic compass based on the assumption that the birds can measure the inclination angle of the Earth's magnetic field.